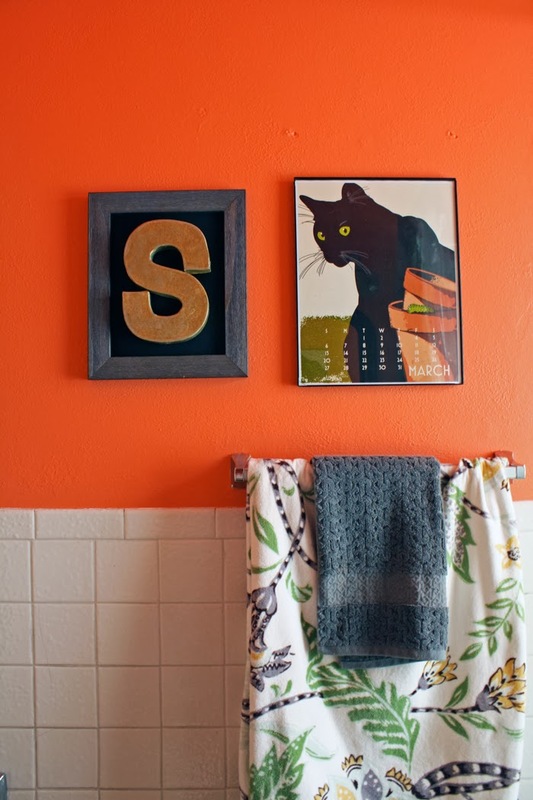 Last year, when I installed our "SPLISH SPLASH" Faux Metal letters in our bathroom, I was pretty wild about them. Loved their look, loved how easy they were to make and loved the silly little phrase I chose to emblazon across the wall. It was cute. I removed the letters before painting the bathroom coral (probably a wise choice...), and didn't intend to put them back up. New color, new feel, I thought to myself. So the letters sat, stacked in the guest room, waiting for their next purpose (which took some convincing, on my part, as Eric wanted to throw them all out after I'd taken them down. Our what's-trash-what's-staying battle will never, ever end). 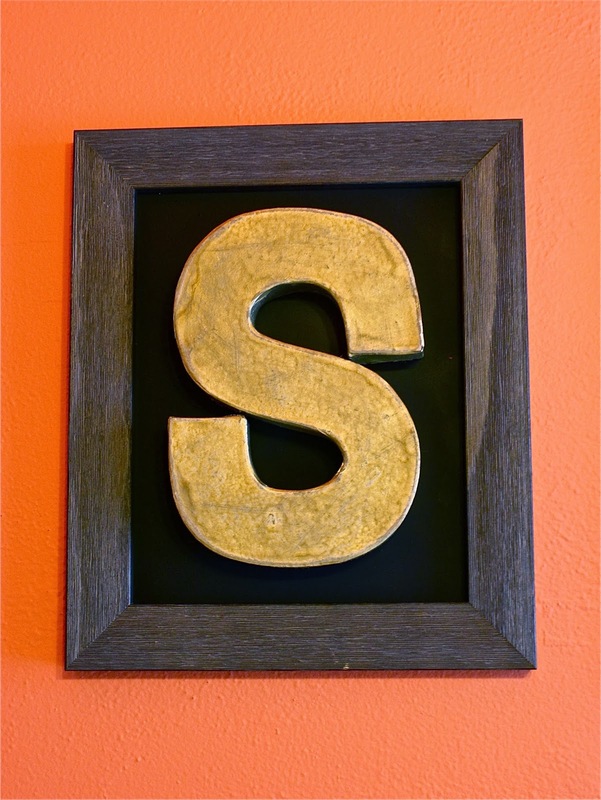 A couple weeks later, I was thinking of making some new art for the bathroom and had a great spark of inspiration - we weren't short on cardboard S's, and our last name begins with an S, so I set out to make a little initial wall hanging. You can read the (incredibly simple) how-to over on Make, Do and Mend, if you like. It was a free project made with things I already had on hand, and took probably a total of 15 minutes to make (which includes paint-drying time). I love it next to our Goodwill-purchased vintage framed calendar. They're good pals up there together. Anyway, the main point of sharing all of this with you is to show you what happened to the rest of the "SPLISH SPLASH" letters after I used up one of them. They now sit atop the old-window hanging in the guestroom. They now make absolutely no sense. And I kind of like it that way. I lay out the letters last weekend, playing some internal anagrams with myself, trying to figure out what else I could spell out with the letters at hand. It was a fun game, but I was a little busy that Saturday afternoon, so just settled on SHIPSPLASH because it was quick, easy and kind of weird. Which, obviously, I love. 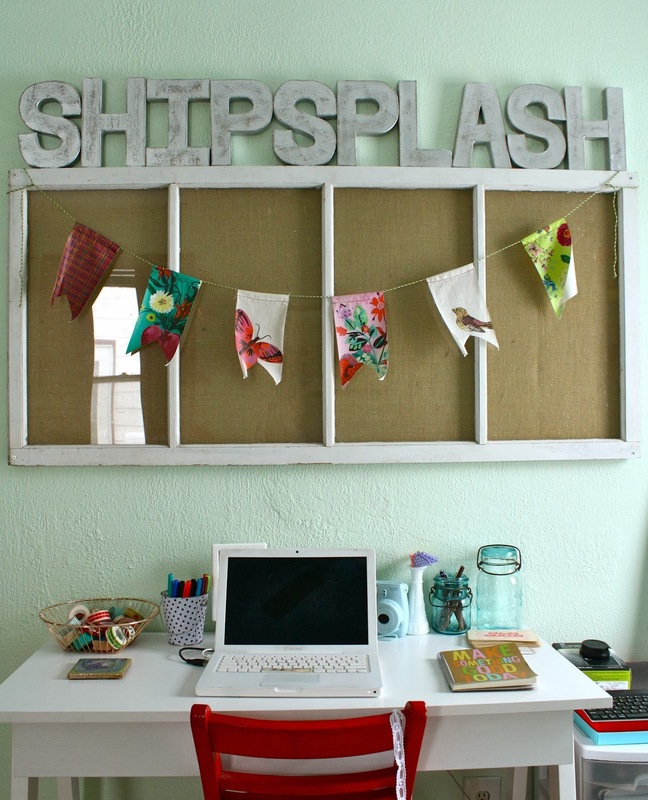 SHIPSPLASH is definitely my new boat name. Although it may have to be my second boat's name, because I don't think anything could beat my #1: Haulin' Oats. First come the names, then come the boats. Who wants to give me one? Anyway, who knows if these letters will stay up in the guest room for long. I was just having a little fun with them, and they're better lined up on the wall than stacked on the floor. 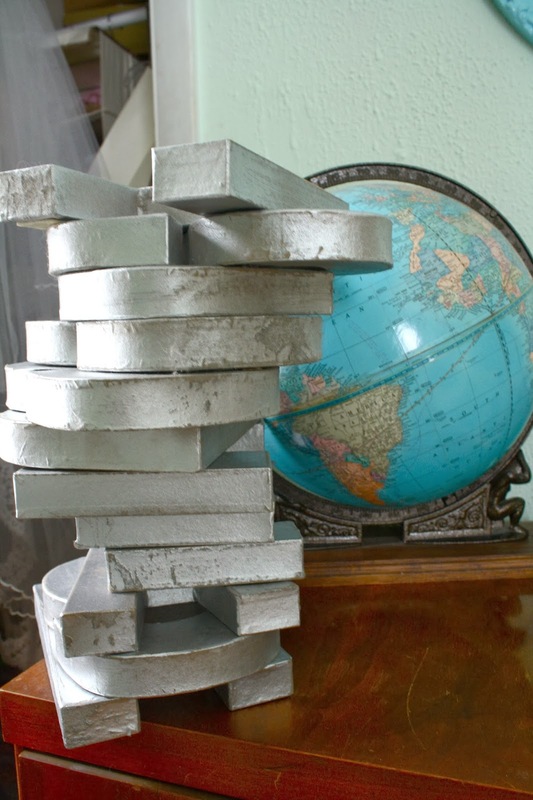 Upon first seeing them, Eric asked, "You're not keeping those up there, are you?" So now, obviously, they're staying up for life.